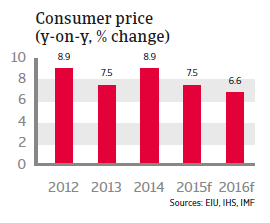 Inflation is expected to remain high in 2015, at around 7%, while the current account deficit is expected to remain at the same level as in 2014 (5.7% of GDP). * The STAR rating runs on a scale from 1 to 10, where 1 represents the lowest risk and 10 the highest risk. The 10 rating steps are aggregated into five broad categories to facilitate their interpretation in terms of credit quality. Starting from the most benign part of the quality spectrum, these categories range from ‘Low Risk’, ‘Moderate-Low Risk’, ‘Moderate Risk’, ‘Moderate-High Risk’ to ‘High Risk’, with a separate grade reserved for ‘Very High Risk.’ In addition to the 10-point scale, rating modifiers are associated with each scale step: ‘Positive’, ‘Stable’, and ‘Negative’. These rating modifiers allow further granularity and differentiate more finely between countries in terms of risk. For further information about the Atradius STAR rating, please click here. Nature of regime: Republican parliamentary democracy and secular state. The armed forces´ political influence has been curbed. The general elections in June 2015 delivered a setback for the religiously conservative Justice and Development Party (AKP), which reached 41% of the vote, but lost its absolute majority. It also failed to reach a two-thirds majority in parliament: the threshold for constitutional amendments and changes. A change of the constitution would be necessary to increase the powers of the presidency, which is the aim of incumbent President Erdogan. So far serious coalition talks between the AKP and other parties have not taken place, leaving the current administration in power as a caretaker government. Due to the political gridlock snap elections are due to be held in November 2015. What some see as Erdogan pressing his own pro-Islamic ideology has increasingly annoyed a growing section of the population, especially in the cities. The protests sparked in Istanbul in the summer of 2013 were a reflection of this growing discontent and, while Erdogan prevailed in the first direct presidential elections held in August 2014, he gained just 52% of the votes. Increasing actions to curb the independence of the judiciary and political interference in the media have raised domestic and international concerns. After the outbreak of the civil war in Syria Turkey has taken a clear anti-Assad stance and firmly supports the opposition forces. Since 2014, geopolitical risks have significantly increased due to the rapid gains of the jihadi group Islamic State (IS) in neighbouring Iraq (Turkey´s second largest export market) and Syria. Consequently, the security situation has deteriorated in the south eastern part of the country due to a massive inflow of refugees from Syria and fighting close to the border. The ambivalence of Turkey to the US-led coalition against IS raised tensions with the US and the EU, as Turkey refused to support Kurdish anti-IS forces and to seriously stem the constant flow of IS recruits across its borders to Syria. This policy was motivated by the fear that the political and military clout of the Kurdistan Workers´ Party (PKK) would increase as a consequence of the on-going conflict in Syria. However, after an IS-led suicide bomb attack in a Turkish border town in July 2015 and due to the increasing security cooperation between the US and Kurdish forces, Ankara made a policy shift by actively participating in the international anti-IS alliance. Ankara has started air strikes against IS targets in Syria and permits the US Air Force to use a Turkish NATO-airfield for its sorties against IS. However, at the same time Turkish forces started to attack PKK targets in Northern Iraq, ending a two-year ceasefire and de facto terminating informal peace talks with the Kurdistan Workers´ Party. This has already led to retaliatory attacks by the PKK on Turkish security forces. The lack of a government with a stable majority in parliament, Turkey´s direct involvement in the war against IS and the new escalation of the conflict with the PKK has increased political risks, and this could result in economic repercussions, e.g. by negatively influencing international investors´ sentiment. In the last decade, Turkey has made impressive economic progress. With political stability since 2002, when the AKP came to power, the country has experienced GDP growth exceeding the European average, while real per capita income has increased markedly. A fast growing population of more than 75 million and rising prosperity have turned Turkey into one of the most prominent of emerging markets. However, since 2013 Turkey’s structural economic weaknesses have resurfaced: among them its stubbornly high inflation, large gross external financing needs, heavy reliance on volatile portfolio capital inflows and relatively weak international liquidity – coupled with increasing political risks. The Turkish currency depreciated sharply in 2013 when investors withdrew money from those emerging markets deemed most vulnerable to the eventual withdrawal of US monetary stimulus. 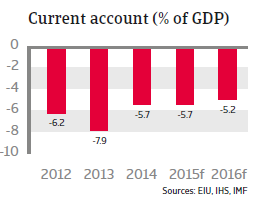 As a result, Turkey faced widening current account deficits and a plunging currency. Since then Turkey has remained one of the most exposed emerging economies to a US Federal Reserve interest rate increase and to shifts in international investors´ sentiment. 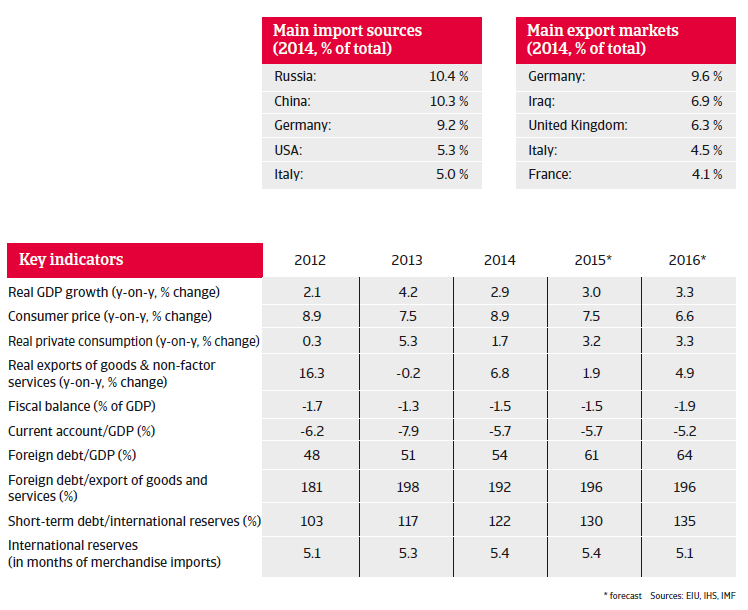 In 2014 the Turkish economy lost steam due to lower export growth as well as decreasing private consumption and investment, both constrained by higher lending rates and a depreciating currency that made imports more expensive. 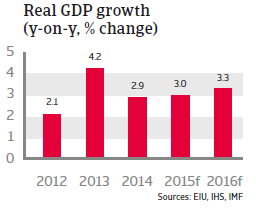 GDP growth slowed to 2.9%, and is expected to increase at the same rate in 2015. Being a large oil importer, the Turkish economy should profit from lower oil prices, which should help to boost private demand, lower inflation and narrow its persistently large current account deficit - a result of a combination of low savings and high investment. But due to the strong lira depreciation, inflation is expected to remain high in 2015, at around 7%, while the current account deficit is expected to remain at the same level as in 2014 (5.7% of GDP) and to decrease modestly to 5.2% of GDP in 2016. Increasing foreign debt and substantial capital imports (foreign direct investment and portfolio capital) are needed to cover the current account deficits. However, since much of those deficits is financed from volatile short-term portfolio investment, this makes the economy very vulnerable to any negative shake-ups in financial markets, which could trigger a massive capital withdrawal and could also lead to more fluctuations in the lira exchange rate. Credit risk in the corporate sector is rising, as Turkish businesses´ foreign currency borrowing is high and still increasing. According to the IMF, Turkey’s total external financing needs amount to around USD 200 billion a year, while foreign debt of banks and the corporate sector increased from around 5% of GDP in 2008 to 18% of GDP in 2013. The on-going depreciation trend of the Turkish lira makes such loans more expensive to service, and the expected increase in interest rates by the US Federal Reserve later this year is likely to drive investment away from emerging markets like Turkey. That said, Turkey´s solvency remains reasonable for the time being. Only a massive lira depreciation by about 30% in real terms would seriously threaten Turkey’s external debt sustainability, and this is not expected within the next 12 months. 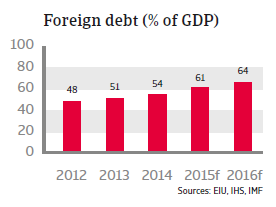 Turkey´s public finances are sound, with small deficits of around 1.5% - 2.0% of GDP expected in 2015 and 2016. Public sector debt remains moderate at around 35% of GDP. However, there is growing concern about the direction of economic policy, mainly due to the Central Bank´s decision to cut interest rates ahead of the June 2015 general election by a cumulative 75 basis points to 7.5%. This happened despite above-target inflation and on-going currency depreciation (another interest rate cut under similar circumstances took place in the run-up to the August 2014 presidential elections). This has raised doubts about the independence of the central bank, as the Turkish government had repeatedly voiced its desire for low borrowing costs to spur growth. It seems that the Central Bank has again bowed to political pressure. The future earnings capacity of the Turkish economy is constrained by macroeconomic imbalances related to high credit growth, high inflation and a large external deficit, coupled with structural issues related to its low savings rate and weaknesses in competitiveness, limiting FDI inflow. The investment climate is also hampered by a weak judicial system and an inflexible labour market. Moves to privatise state banks and the power sector are also proceeding too slowly. Without structural reforms to raise savings, reduce dependency on energy imports and improve the investment climate, Turkey´s potential growth rate will decrease to 3% - 3.5% per annum. 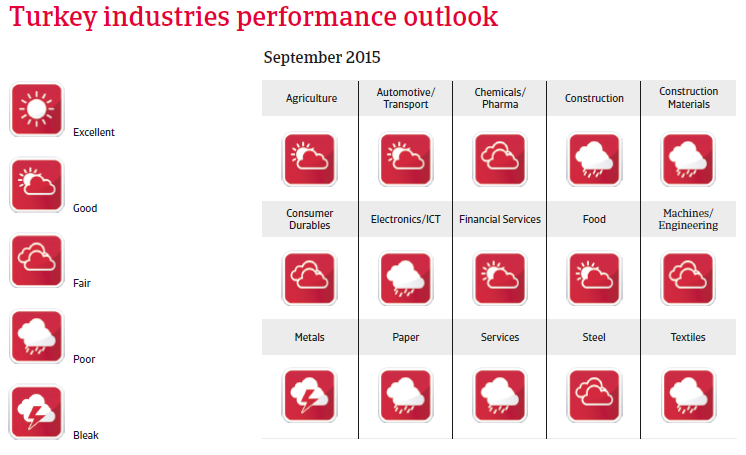 However, no major structural reforms are expected in the current political situation. Despite the significant amount of time given B2B customers to pay their invoices, a sizeable proportion of the total value of domestic B2B receivables in Turkey (55.2%) was overdue. Turkey has traditionally been a strong trade partner for both Europe and Asia. The ten principles underlined in this report look at how a successful trading relationship can be achieved. Despite a drop in output of 3.4 % to 34.65 million tons, Turkey kept its position as the world’s 8th largest steel producer.